“It’s so nice to have nothing,” said Ines Verbeke. Ines, born in the States but raised in Belgium, was talking about living a minimalistic life as she realizes a long-held dream to cycle across the country of her birth. Prior to leaving Europe for the adventure she gave away most of her belongings. She’s traveling across America with little clothing — including two jackets: one for warm weather, one for cold weather — and a tent. “It’s nice to live more simply,” she told me during our dinner. 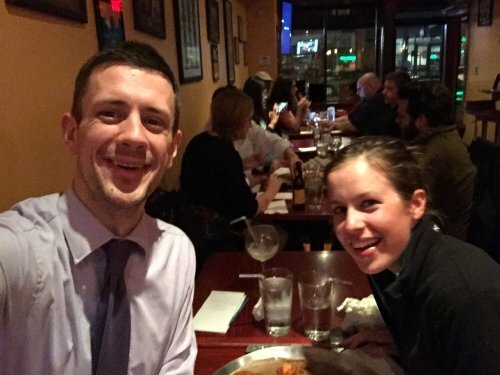 A few days prior to meeting Ines, I received an email from her telling me she’d be cycling through Washington, DC, and she wanted to take part in Dining With Strangers. She wanted to try some cheap, local food. 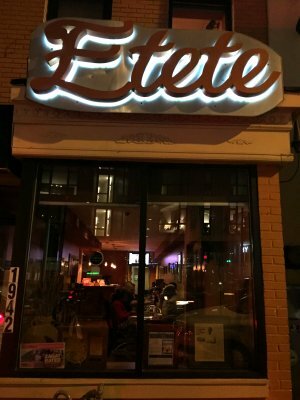 Immediately I suggested Etete in the city’s U Street neighborhood. 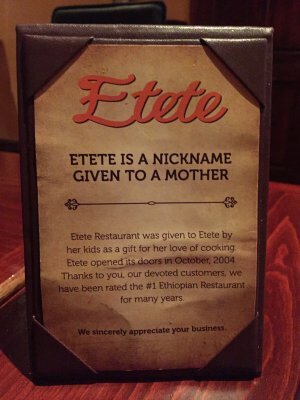 It’s an excellent standard-bearer Ethiopian restaurant, of which the District has many. 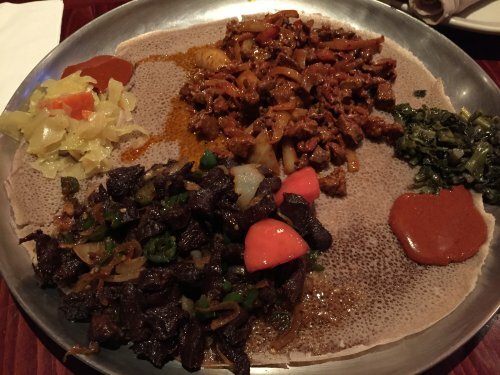 As we browsed the extensive menu of simple Ethiopian dishes, Ines quizzed me about my move to America and my website. I was happy to be the interviewee for a few moments, because Ines is a friendly, attentive dining companion who was engaging asking the questions and when being asked them. But soon enough it was time to shift the focus back on to her journey. 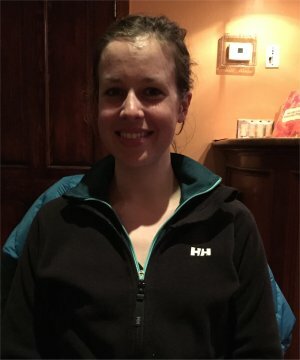 She’s launched a blog called The Tomorrow Tales on which she regularly posts updates about her two-wheeled trek. Recent entries include her solo tour around Yale University in New Haven, Connecticut (including some gorgeous photos of the campus) and a stop in Fort Lee, New Jersey, where her host — a total stranger — wowed her with homemade Italian food. Ines, 25, was born in Greenwich, Connecticut, where her journey truly begins. Her Belgian parents were living in the States at the time, and they remained in Connecticut for roughly a year after their daughter’s birth. Then they moved back to Belgium. Ines was raised over there and considers herself thoroughly Belgian — though she’s always been interested in America. After years of exposure to U.S. television shows, movies and other pop culture, her desire to visit the country of her birth kept growing. But when to go? She was working in a promising, lucrative job in human resources for the consulting firm Accenture. She was a talent fulfillment analyst. “Nice title,” she said with a grin, then explained that her fast-paced work involved matching consulting projects with people who had the requisite skills. Things were going well. For most people the prospects of building a career would outweigh selling everything and leaving the country. All she knew before coming across the Atlantic was that she wanted the luxury of not being constrained by a particular route. Rather, Ines would aim roughly for a journey from east to west but with no set path. Cycling would give her the ability to be completely independent while minimizing costs (compared to say a car or train rides), and to move on whenever another destination appealed. So after taking care of organizational things — getting rid of her stuff, having her parents monitor her mail — she said an indefinite goodbye to Belgium and boarded a plane to North America. Her first stop was actually outside the States, in Canada. Ines had an uncle in Montreal that she could stay with, and so she visited with him and explored that city. She bought her camping gear and bike. And then the duo went to Vermont, the first official stop on Ines’ U.S. itinerary. She’d never ridden the bike before, so her uncle watched as she practiced with a few laps. And then she was off and cycling, heading south. My ability to maintain a normal body weight was also heading south, thanks to the arrival of our appetizer. 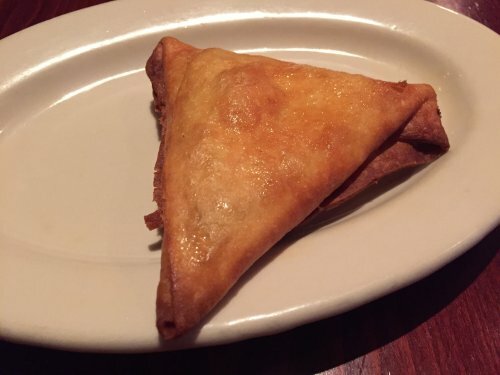 We both opted to try one of the lentil sambusa. They’re triangular pastry crusts filled with lentil, green pepper, jalapenos, onion. Served piping hot, it’s advisable to take a small bite and then let them cool. When you do get the chance to have a proper taste, you’ll experience a tasty kick from the peppery filling. While we ate, Ines explained how she’s using a Lonely Planet guide to the States to inform her route. She’s stopping in places she finds interesting — including Philadelphia and Washington — as she makes her way south for warmer weather during the winter. Some of the places she wants to see in the South include Savannah and New Orleans, and then on to California. To date, her accommodation has been taken care of either by staying with friends or the websites Couch Surfing and Warm Showers, which provide social networks of people offering a temporary roof over one’s head. Ines had hosted some people in Belgium for Couch Surfing, so she didn’t have any nerves about staying with random hosts in the States. She said that despite traveling solo, her extensive research ahead of the trip means she’s never been scared at any point. Riding on her own also means that she’s free to stop and chat with anyone and everyone, and she touts meeting people as the highlight of her trip so far. “People have been surprisingly nice, asking me lots of questions,” Ines said. In fact, for anyone interested in hosting and meeting Ines, she’s got a form on her website to fill out. Maybe she’ll be cycling to your town next. Her blog is mostly for family and friends, so the only real promotion she does of it is when it comes up in conversation with the strangers she meets. She’ll write entries when she has downtime — and a reliable wifi connection — at a host’s place, before moving on again. I’m glad Ines spent enough time in DC to meet with me for dinner. Our main course had arrived: a huge circular tray lined with a rolled-out injera, which is spongy, sourdough-risen flatbread. On top of the bread were two of Etete’s beef specials. First was the derek tibs, sauteed with onion, pepper, tomato and butter. The second dish was yeawaz tibs, sauteed in a hot pepper sauce with onion, tomato, garlic and chili. 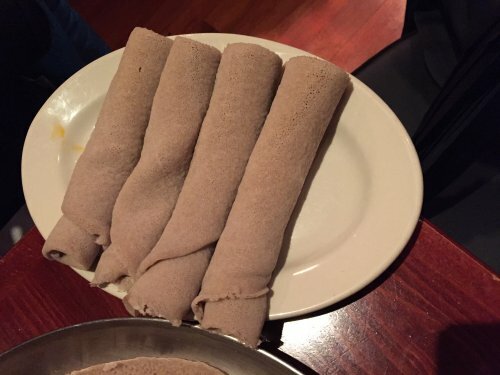 Our waitress provided a plate full of smaller, rolled-up injera from which Ines and I pulled sections, wrapping it around the meat and the vegetables on the plate, and eating it all at once. Delicious, albeit very spicy. My bland British palette doesn’t cope well with fire most of the time, but the mild pain was worth it for the fine food on offer. I’d definitely come back. 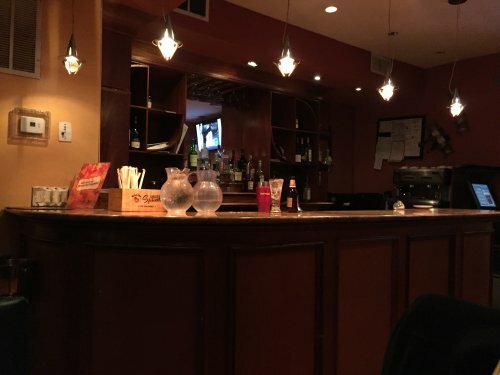 Ines, however, has countless new restaurants to try wherever she chooses to ride to next. She’s surviving for now on savings, but recognizes that eventually she might have to use her dual citizenship and apply for a Social Security number and start working. Until then, she’d rather just keep pushing ahead at her own pace, exploring the United States. But the focus at the moment remains America.